All systems go on Plan B everything is now ready and lots of people have turned up it is still a totally Stress Free Zone despite all the mud!! Horseworld confirmed they are bringing 2-3 horses and 2 members of staff. It is definitely Plan B, everything in the school and immmediately around it, although the saddlechariot/iBex demo could well be outside weather permitting. Horse Agility will be held on the permanent course, we are prepared to do the Agility, you can have a go if you have your own horse, just let someone from Rowanoak know and we will arrange a time. It is with regret that some of the original demonstrators/talkers have had to pull out. Louise Talintyre will be here with The pure Feed Company but Copy is unable to come due to Laminitus. We will entertain you on both days with the Saddlechariot and iBex, Flying with Horses, Ann-Marie Marek, Emmaline Pell and Patrick Meyer. Yes, The Wholehorse Weekend is still going ahead, despite a few hiccups and the weather forecast being rubbish!! Plan A: It will all be held in the main show area which is set up and ready to go, looking at the forecast at the moment we may well have to go to Plan B. Plan B: Move everything into the indoor school, it will be equally as much fun and enjoyable but cosier!! Should the weather break and look as if it will last a while we will move to Plan A. Horse Agility can only be held outside regardless of weather, if it is tipping down and you would still like to have a go or see a demonstration please ask someone in a Rowanoak shirt and we will be more than happy to oblige. I walked all the fields today, the camping area is good on the higher ground, the show ground has a couple of wet areas but the majority is good, the majority of the car park is good. It is still going to be a great weekend, if it is still raining on the Saturday night we will have a get together in the indoor school. It is with regret that Copy will not be able to attend as he has Laminitus but Louise from The pure Feed Company and Mendip Stud will be here. We really appreciate your support as all the demonstrators and talkers have donated their time free of charge in aid of a very worthwhile charity Horseworld. We will update this again Tomorrow and Friday night. If you have any questions or queries please do not hesitate to e-mail me nick@rowanoaklivery.co.uk or phone me on 07870765018. Welcome to our new site, it is still under construction so please visit regularly for updates. All the preparations are going really well, the mini jumps turned up this morning for the 2 legged grand national. Lots of prizes and rossettes to be won. We have Patrick Meyer coming to do a talk on barefoot trimming and the benefits. The herd are getting excited, looking forward to you all coming to see them. The permanent Horse Agility course is looking great, the camping field is currently being grazed by the herd ready for the 23rd. Just got confirmation that the sun will shine. There will be a super party on the Saturday night. Come and join us, £5 admission for Adults, children FREE. If there is more than 5 adults one of you can come in FREE. Looking out of the window at the moment, we have stunning views and happy horses. Fun for all the family, old and young, horsey or non horsey. Lots more people have booked in, making it an even greater Weekend. Due to unforeseen circumstances Elaine Tyley of Lafayette Equine Therapy (Horses Voice) has had to cancel. this out and display it where the public can see it. Many Thanks.
. Please use the email addresses on our contact page. Thank you. This years Whole Horse Weekend will be held on the 23rd and 24th June 2012. 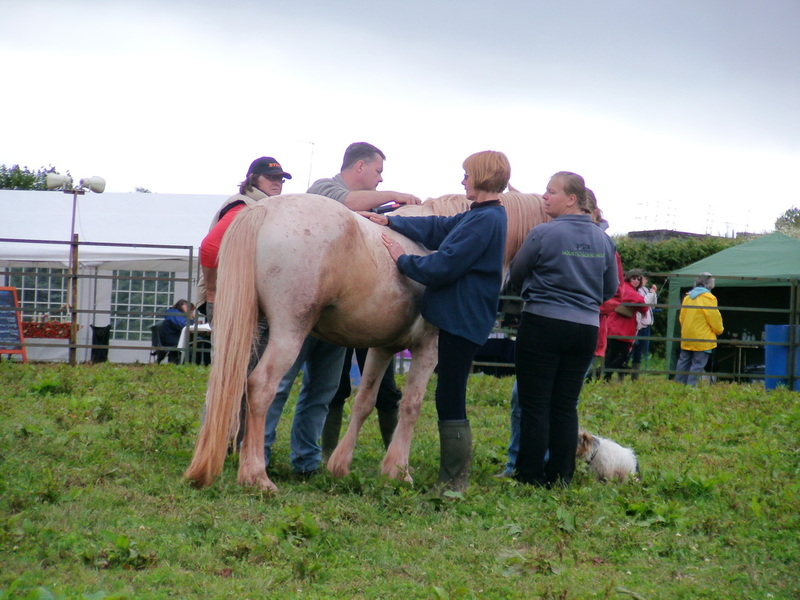 This event is in aid of Horseworld, Bristol, Registered charity: 1121920. Horseworld rescues, rehabilitates and re-homes horses, ponies and donkey's. These have been abandoned, neglected or ill treated. Horseworld is funded entirely through public donations. Sue Palmer - Veterinary Physiotherapist at Mel's Head (one of our own horses)demonstrating some techniques.